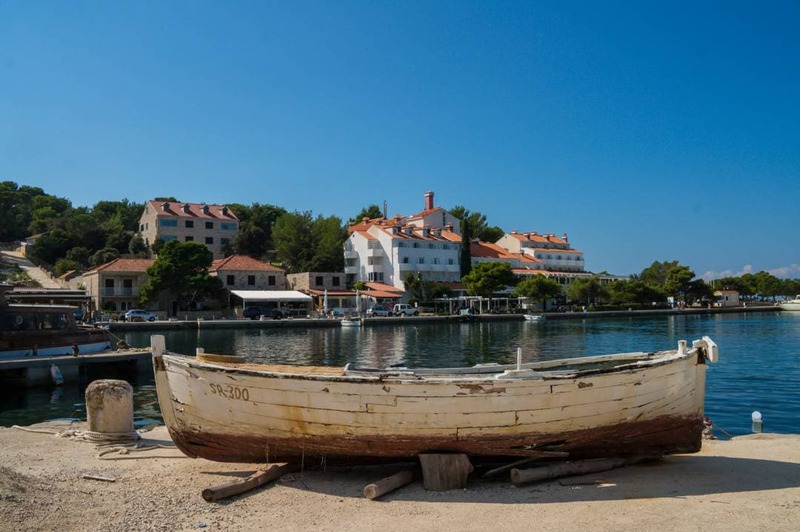 Is island hopping in Croatia on your dream travel bucket list? If it’s not, I’m here to tell you that you have to add it to your list today. A 7-day Adriatic cruise along the Dalmatian Coast hitting Croatia’s most famous island’s and ports was a dream of mine for a very long time. 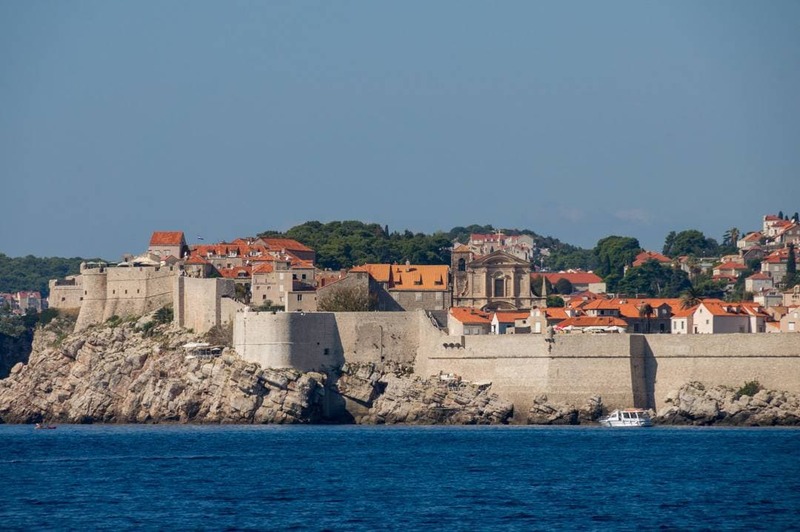 Before Dubrovnik became Kings Landing and Game of Thrones tourism was born, I wanted to visit Croatia after hearing my Grandmother rave about it. 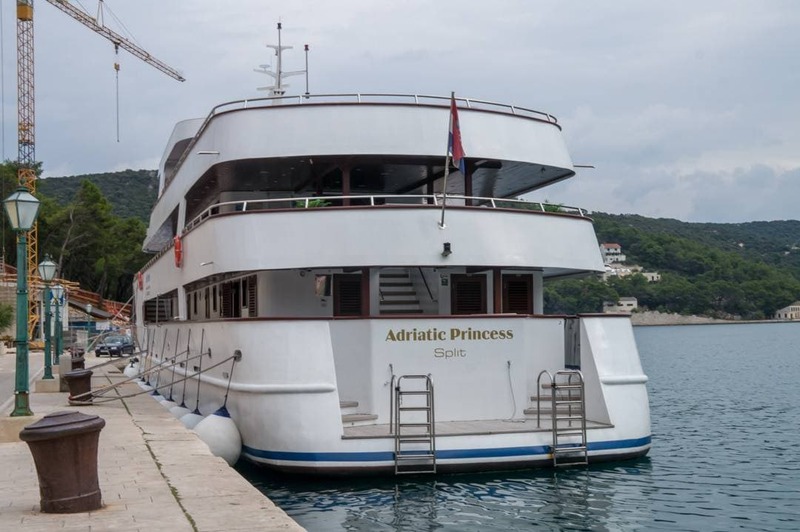 In this post, I share my adventures island hopping in Croatia on Elite Travel’s Adriatic Princess 7 Day Dalmatian Islands Cruise. 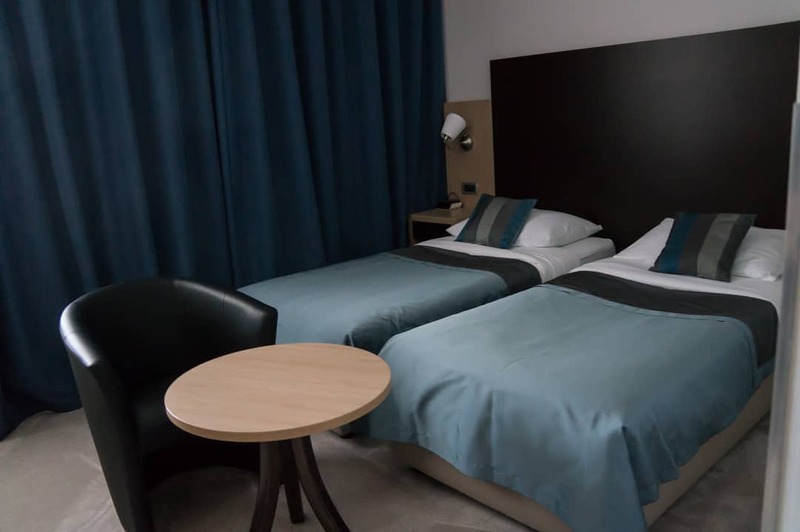 Looking for Hotel Options in Split? 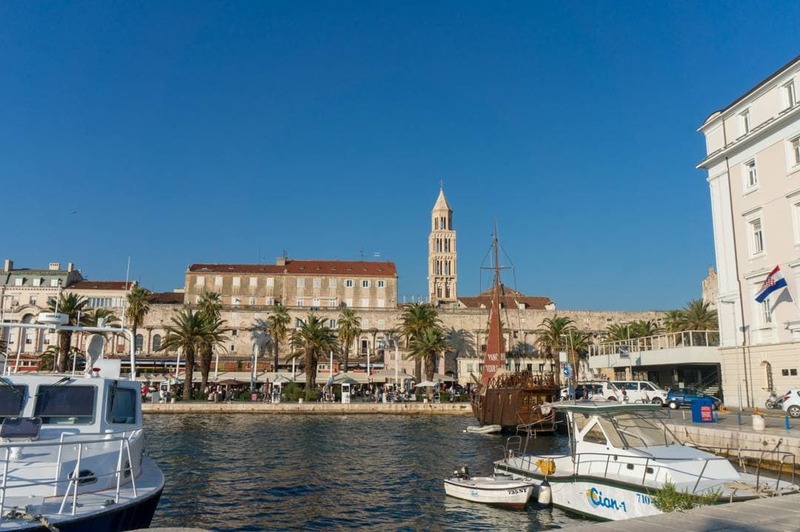 I’m not a big planner of these multi-city trips as I wrote in my post The Easy Way to Plan a Dream European Vacation in Croatia, so when I saw a land and sea package already built for me which included flights I knew this was the trip for me. 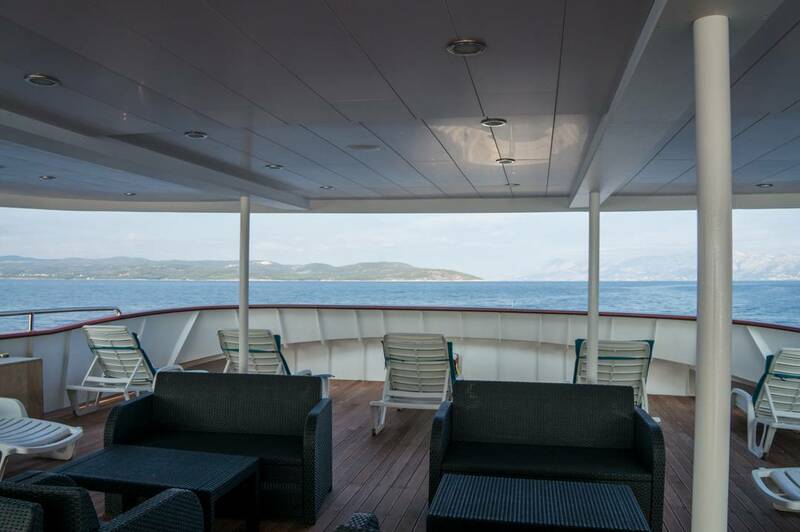 Important to note that while I booked with Transat the distributor of this cruise part of our trip was Elite Travel and the ship was the Adriatic Princess. I will write more detailed posts on each stop on our cruise and give you a full picture of what a Croatian experience can be for you. Now that I know what I do, I’m confident I could plan a land-sea trip on my own with all the elements, and I hope that you will all be able to do this too. Part of our tour package was the promise that we would be greeted at each stop and escorted to our accommodation. We arrived at the bus terminal in Split and were welcomed by one kid. We were two girls with two big bags of luggage and our carry-on bags. Hey, it was a 14-day trek through Croatia in autumn, we had to pack for warm coastal weather and cool autumn temperatures in Zagreb. Let’s say; there was no buggy, no car, we had to walk awkwardly behind this kid, on the busy sidewalks along the port in Split. Not an ideal situation and entirely different from the transfers we had throughout the rest of our trip. I realized the Transat representative assigned to us here in Split was not very keen to do her job. At the boat, we were told to leave our bags on the dock and were escorted through some cruise ships all parked side by side in the port. This is common for these cruise yachts and became a way of life during our 7-day cruise. The staff on the boat worked to get our luggage to our cabin, and the cruise director walked us through the ship on a mini-tour. 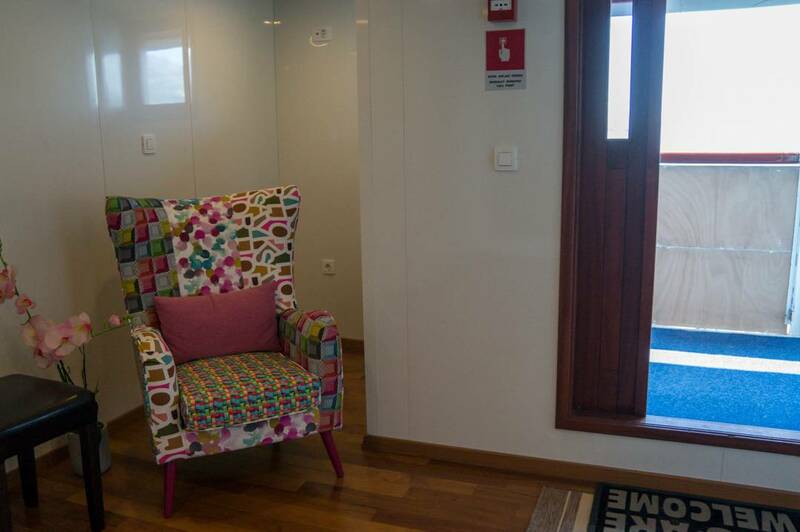 Every cruise yacht had its special chair and décor for its main hallway. This is an important feature to recall when there are 4 or five boats docked together and your boat switches places while you were on shore. Our cabin was located on the lower deck under the stairs. This was a bit of a bonus as we had extra storage space underneath the stairs which was great for storing our luggage. There were also storage spaces with the life jackets under the bed. 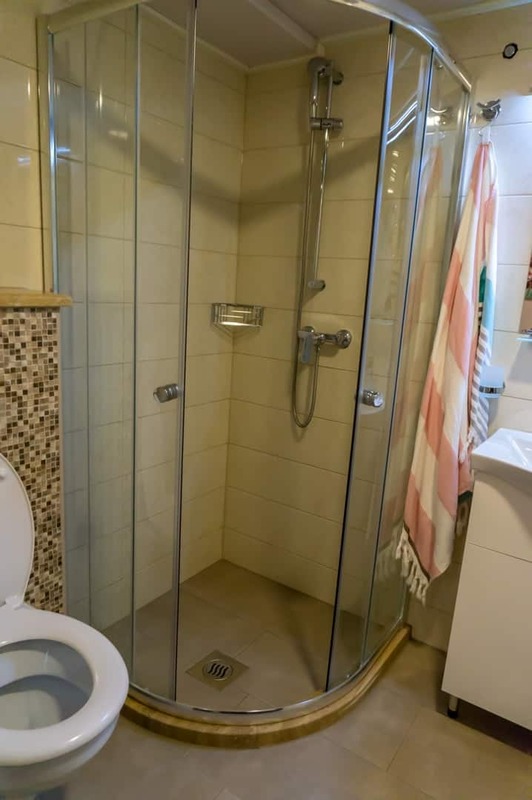 The Bathroom had a corner shower stall, sink and towel rack. There were places to hang a toiletry bag, but very little shelf space to keep your things. I will go into detail about each destination on our cruise in future posts here is the Itinerary of our Croatia island hopping tour. 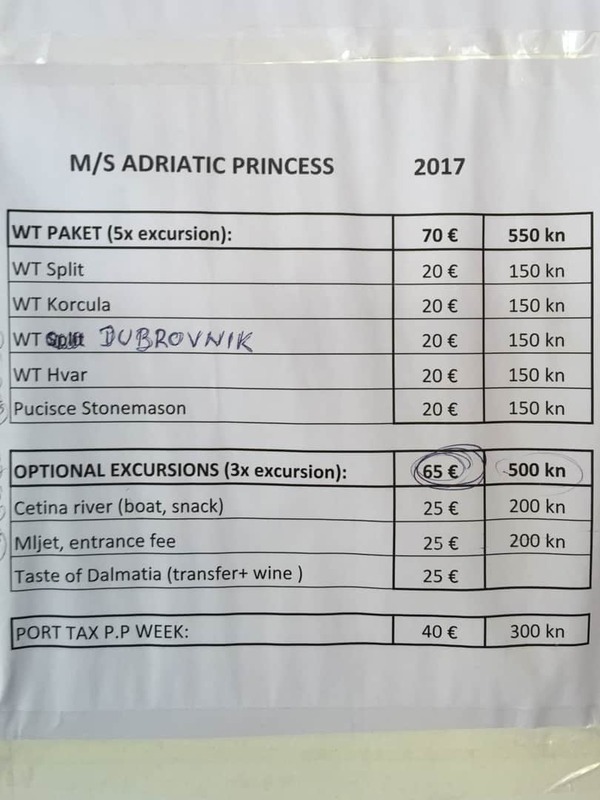 This is the itinerary for the Adriatic Princess 7-day Split to Dubrovnik to Split cruise. Each year they give it a different name. 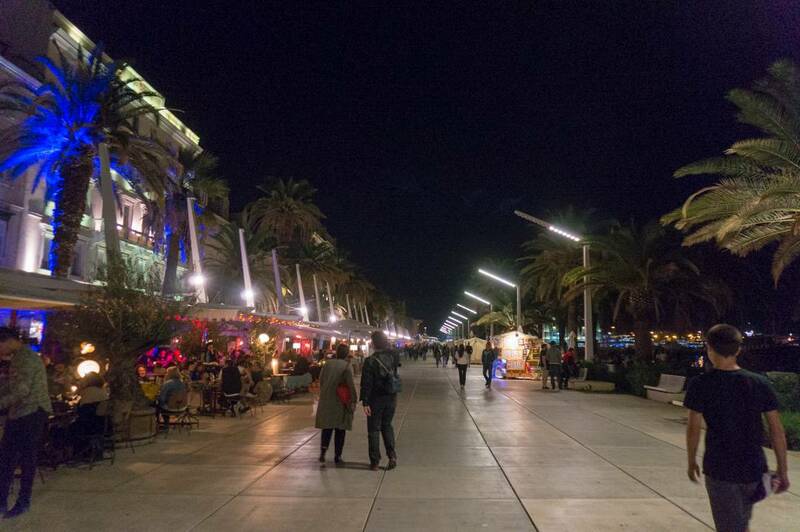 After boarding and unpacking in our cabin, we had free time to walk around in Split. We were docked steps from the old city and outdoor markets. 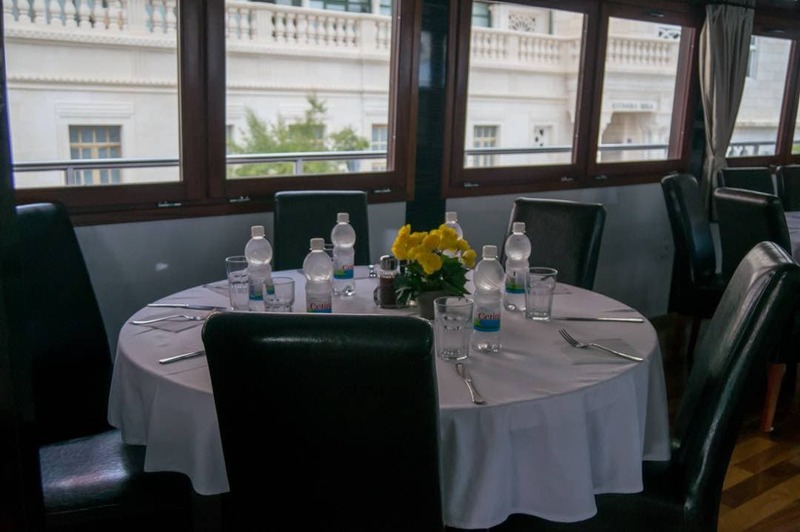 Dinner was onboard the boat in the dining room and included an orientation and mandatory meeting. Food was meh in my opinion. We started with a salad, then a fish course, meat course and dessert. The beautiful thing about dinner was it allowed us to meet the other passengers who were all lovely. A mix of Australians, Germans, UK and we were the two Canadian girls. After dinner, we had more time to go and explore the city. I highly recommend this as there are evening performances in the heart of the palace and the acoustics were extraordinary. 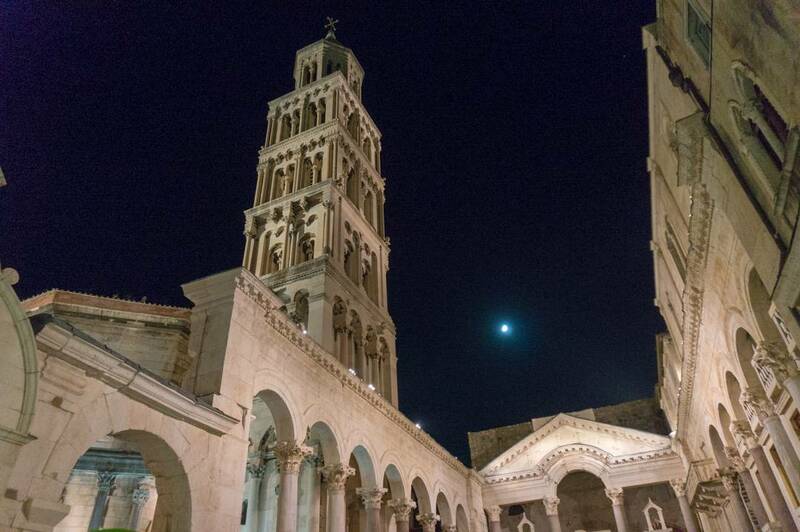 It was a bit of a breezy night in Split. However, there were many bars and patios open throughout the old city. The island hopping in Croatia was just a dream. 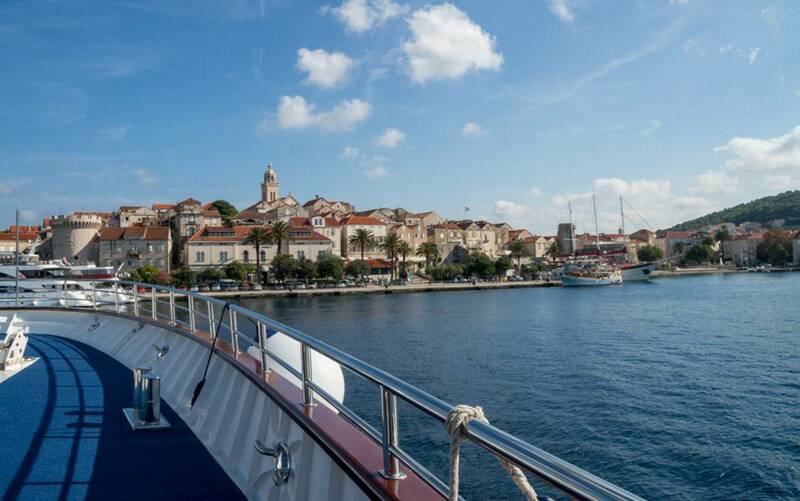 We left Split after breakfast and made our way to our first port Hvar. After stretching our legs and walking around Hvar, we made our way back to the boat for an afternoon at sea on route to Vela Luka. 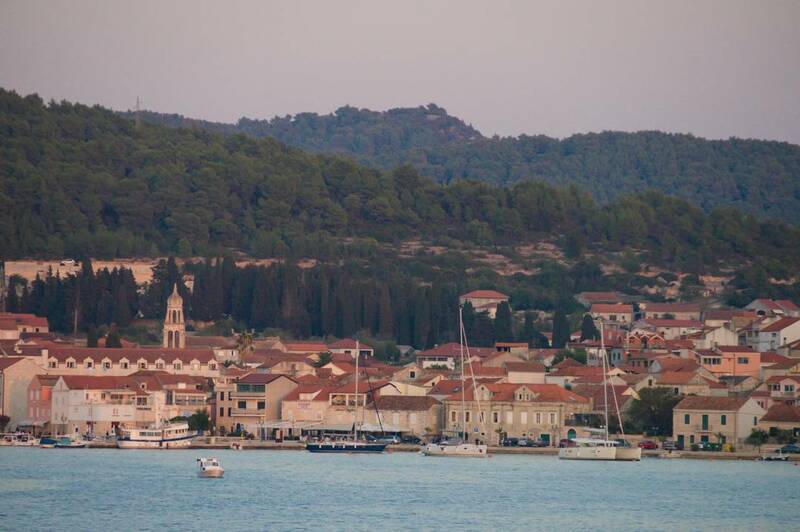 We left Vela Luka again early in the morning and headed to Mljet Island. There were optional excursions here to visit the National Park. We chose to hang out at the bar in one of the hotels in Pomena where you could jump into the water and swim and relax on the sun chairs. 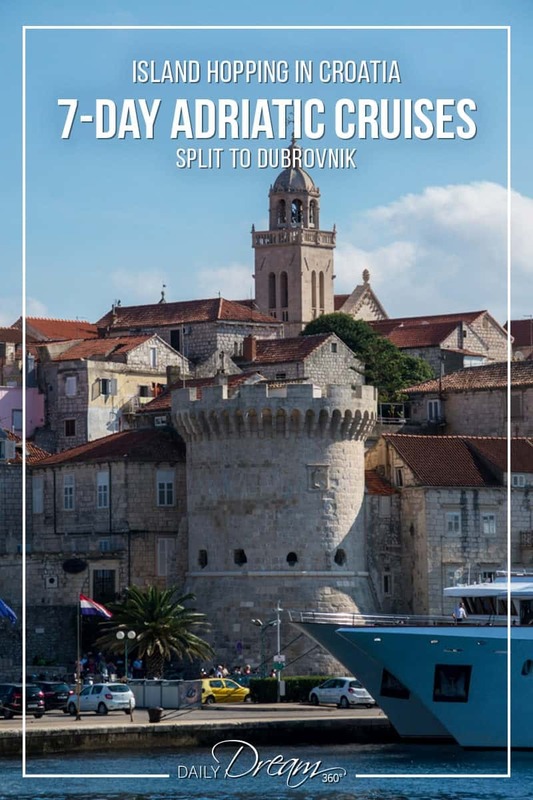 On day four we had the option to stay on the ship and get to Dubrovnik by sea or take a bus excursion to the town of Ston Croatia. We didn’t have much time to explore Slano, and the idea of participating in a wine and cheese tasting was very appealing. 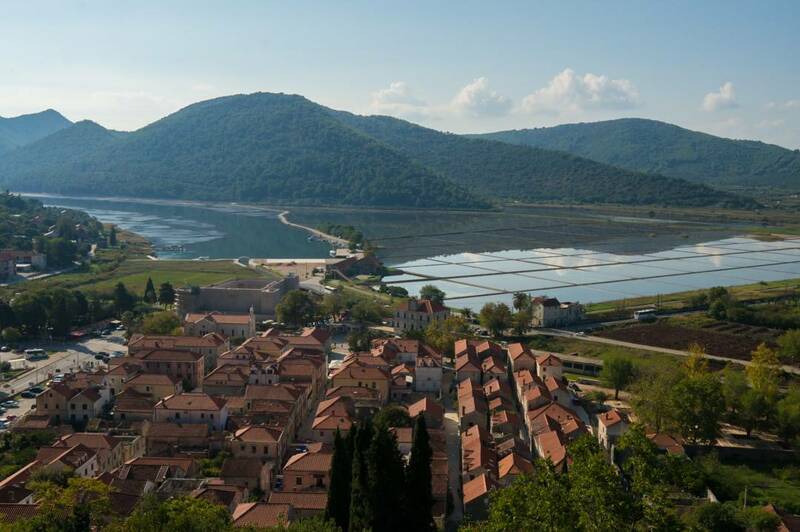 On this excursion which I will detail in a later post, we visited the small town of Ston which is known for its salt production and the famous 5km wall which climbs the mountainside. This is the largest wall in Europe, and I had the opportunity to climb part of it to capture the view in the photo above. After our wine tasting, we hopped on the bus and made our way to Dubrovnik where we caught up with our cruise ship. We had enough time to take a walking tour of Dubrovnik and enjoy dinner in a Dubrovnik restaurant. I chose to stick around and explore Dubrovnik vs take the bus ride to Montenegro included in our Cruise. It allowed me a free day to walk around, take photos and experience everything there was to experience in Dubrovnik. 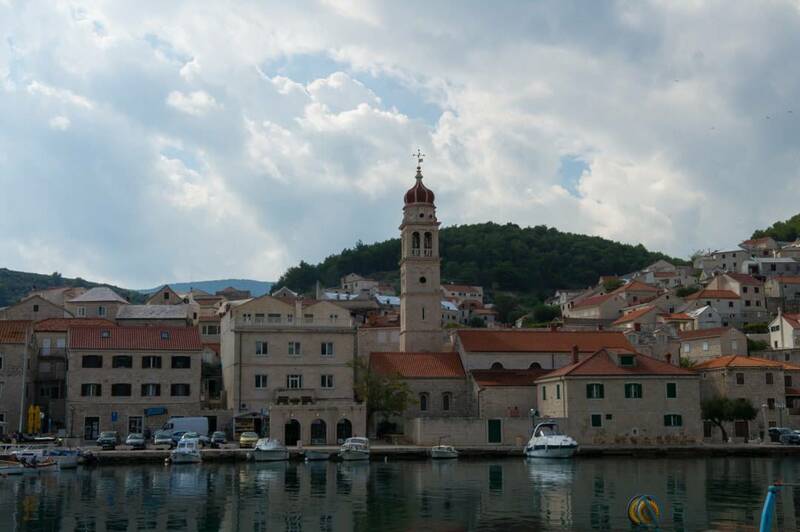 Many of the cruise passengers, however, jumped on a bus and took a day trip to Montenegro. There are mixed reviews on this excursion as some have reported that the border lineups are long, but everyone we spoke to enjoyed the day and were happy to stamp another country in their passports. 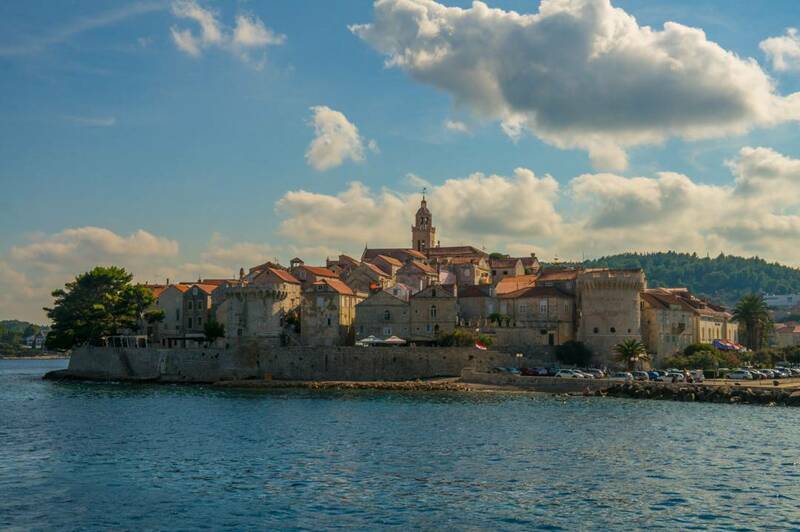 Korcula was my favourite stop in Croatia. A dreamy walled town with breathtaking views, cute shops and restaurants. I just loved Brac as the people were so genuine. There were lots of great little shops here and local markets. We grabbed cheese, fresh fruits and more during our stop in Brac. Unfortunately, the weather turned on us, and we did not make it to Omis and ended up coming back to Split a night early. This was disappointing as there were excursions to Omis planned and I was not keen on how the cruise director handled this hiccup. Not much you can do to control the weather. We spent the night on the boat in Split vs having a morning cruise ride into the city. It was very rushed to get us out of our cabins and off the boat as they frantically cleaned it for the next tour. Below I have more details on the staff and ship. While this was advertised as a new ship, it appeared to be in disrepair. This led me to believe that this ship was not a new ship but a refurbished ship that was in its first year of the voyage. I wasn’t buying the new boat claims it just didn’t add up. Many of the passengers with us complained about something in their room, broken or not working. We had it pretty good considering some stated, fans roared, towel racks broke, and they had assorted plumbing problems. In our cabin, we had a shaky sink faucet, and our toiletry dispensers were broken on the floor of our room. The shower leaked a lot of water onto the floor of the bathroom and towels were not replenished more than once throughout the week. The last few days there were more drainage issues with the shower, toilet and even a drain on our floor. The sewage type smell coming out of the bathroom was not pleasant either. I thought this was a bit cheap. We were given one 500ml bottle of water each day at our meal. Water is a necessity and limiting each person on the ship to one bottle of water a day just left me with a bad feeling. Why do I have to buy water from the bar at an inflated price? This leaves me to the most annoying part of our Adriatic Cruise. The expectation that our bar tab was to be settled cash only, that all port taxes were cash only and everything seemed to cost extra. Most travellers don’t bring that much money, myself included, so we ended up, bringing in big bottles of water and avoided the bar altogether. Luckily I’m not a big drinker, as you are at the mercy of the bartender marking down all your drinks manually and handing you a bill at the end of the cruise. I’m not a big plan every second of my trip ahead of time, but I do like to to know what options are available to me ahead of time and what their cost is. This information was given to us on the fly most of the time. 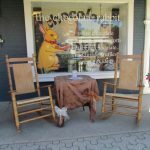 We’d be sitting for lunch, and we would have a meeting where the excursions and walking tours available would be shared with us. Again we had to budget because all these extra walking tours had to be paid in cash. I hesitate to put prices here because they may be different throughout the season and we took one of the last cruises of the 2017 season, but so that you can get a sense of what you have available to you once you board the ship here are some options. 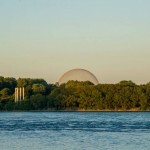 There was an option to purchase either the full package or individual tours. Some were led by the cruise director, and others were led by a local guide. 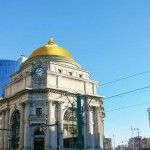 These walking tours are about 1-1 and a half hours and an excellent way to orient yourself in each stop. This package appeared to be quite reasonable in my opinion. However, I only bought the Dubrovnik walking tour on its own. Of all the complaints I heard on the ship the most important was that our cruise director did not help resolve issues. I’m not talking about leaky showers and no toiletries like our issues (which were not fixed or dealt with at all) but serious problems. There was a passenger that needed medical assistance during our cruise. He had an infection and needed antibiotics. By the time we reached each village, they either didn’t have a pharmacy, or the pharmacy was closed. 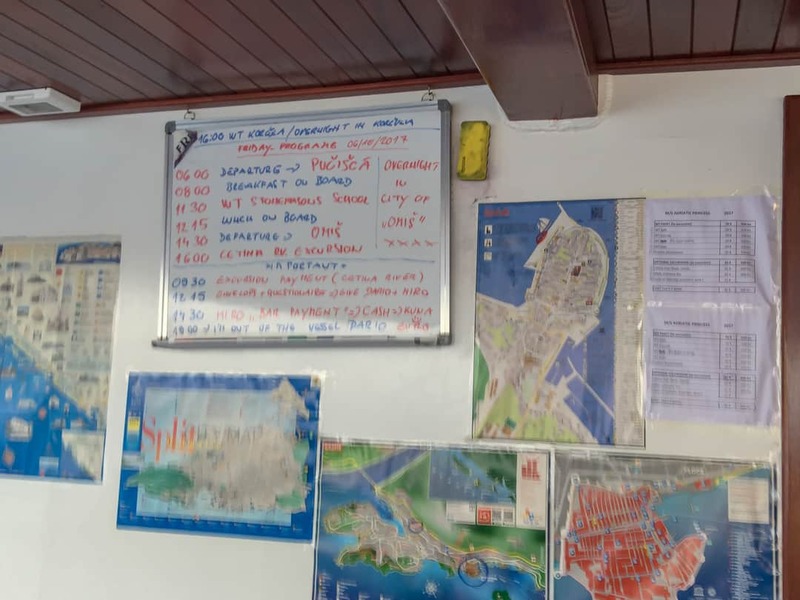 Despite the promises that the cruise director had called ahead to confirm they would be open when we docked no effort was made to help the passenger. It took over four days of cruising before he was able to get his prescription filled. I was quite shocked by the way the Cruise Director handled everything. Lying about the hours of the pharmacy being changed at the last minute. “They changed the hours there is nothing I can do, what you do on your own is your own business.” They asked him about how he phoned the pharmacy right? To confirm the hours? He denied and pushed everything back. Such bad hospitality. I would never travel with this company again. In fact, I was so turned off by him that I didn’t do most of the excursions or walking tours as a result. I didn’t buy any drinks on the boat only when we docked at local pubs and restaurants. As a female traveller, I also did not feel the crew went out of their way to speak with me or get to know me. Mostly a smile and hi, but on the last day after they announced their interest for a tip they suddenly were even more smiley and interested in talking to me. It could be a cultural thing, but I asked a few innocent questions and felt I was getting defensive answers at times. The tip situation was also super annoying. They held a meeting and presented a formula for how to tip the staff. The whole thing was done in deplorable taste with marked envelopes for each cabin, so they knew who tipped what. Very awkward and unfortunate. 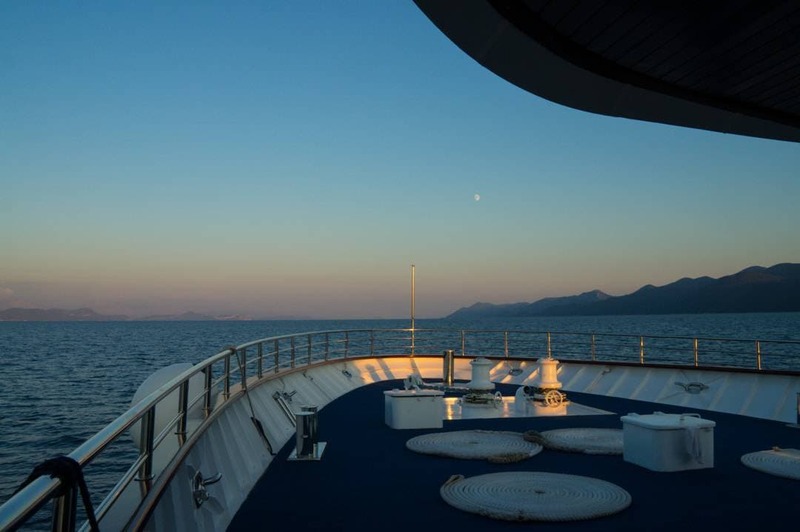 Since I did not have a choice in which cruise I was on other than the Croatia cruise itinerary I have some tips on what to look for when researching your Croatian island hopping cruise. As I walked through other ships, I took notes about what the other cruises offered that our did not and the level of luxury on each type of vessel. 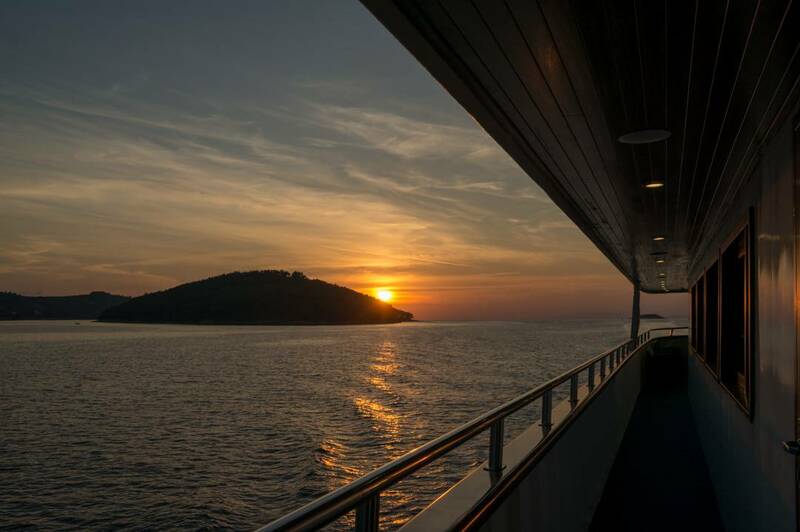 Here are some essential tips on how to pick the best Adriatic Cruises in Croatia. 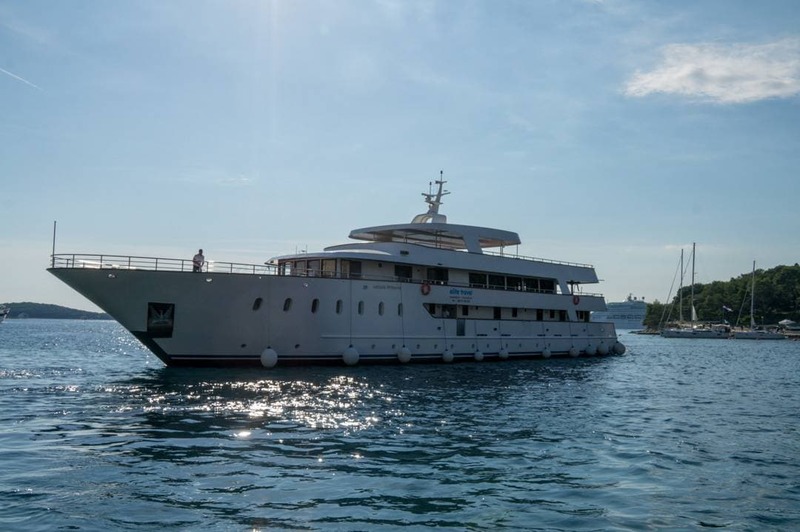 In my research, I found there are three main types of yachts you can do your Dalmatian cruises with. Luxury, Premium or Comfort boats. Luxury Boat – If you want to travel five stars these ships come with a price tag. That said you can expect high-quality meals, bigger cabins and more luxurious boat features on these boats. Premium Boat – These ships are bigger and more luxurious. They will often include extras like towels, beverages and meals. We passed through many of these premium boats when docked and noted their furnishings were better, and some had hot tubs on their sun decks. 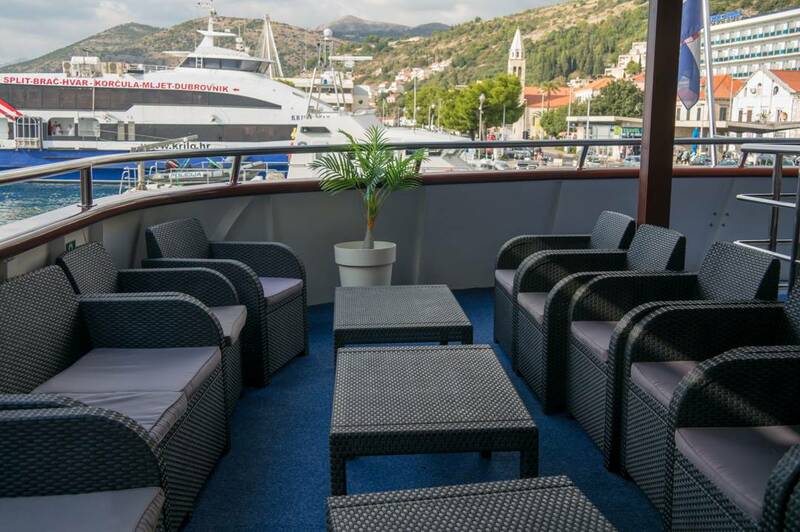 Comfort Boat – I would describe the Adriatic Princess by Elite Travel as a Comfort boat. This would have been just fine if the staff was better and the ship was in better condition. 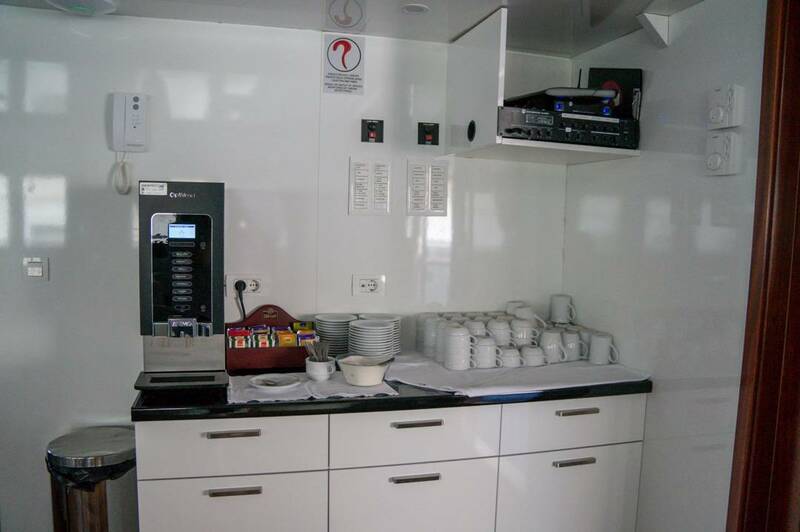 Research comfort ships as some of them are better for young backpackers and have shared bathrooms. The number of meals and quality of meals is also a factor when choosing these standard models. 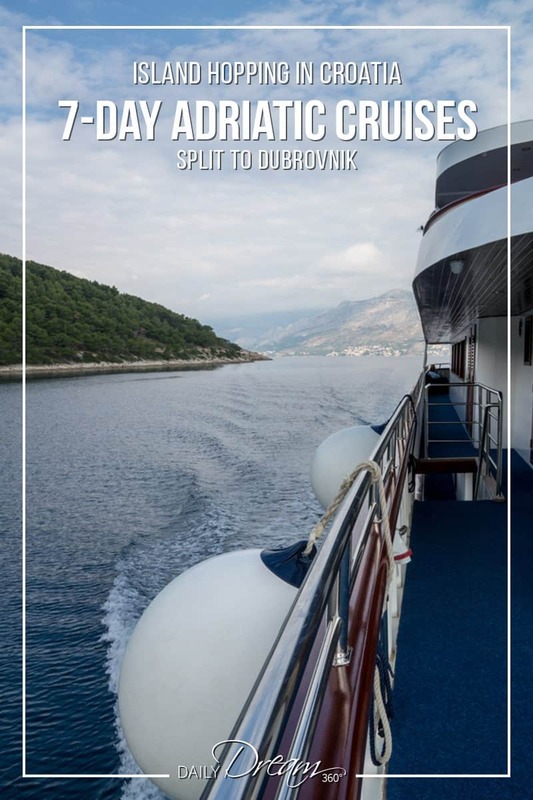 Most of the cruise ships offer similar itineraries that leave from either Split or Dubrovnik. Some travel in one direction only island hopping along the coast between the two big cities and others were round-trip island hopping packages like mine. What are the included meals? Are beverages (especially water) included? Ensure you understand extra fees. What payment options will you have? Depending on the Boat design, cabins can be found on one, two or three decks. 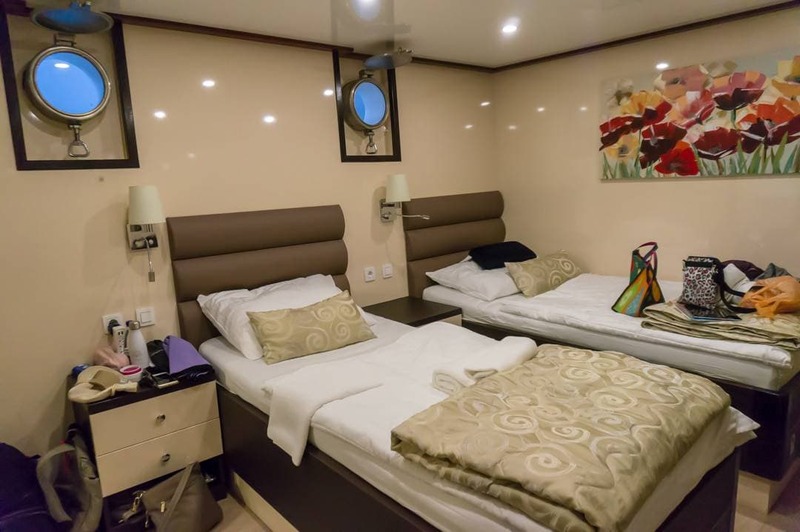 Some like cabins on the upper floors to be above water and have a great view, however, the idea of being on a cruise ship of this type is to stay in the room as little as possible. Personally, I was fine being on a lower deck as I spent most of the time on the sun deck or in one of the common areas when on the ship. Finally, take note of supplemental charges for solo travellers. Most of these cruises are priced based on double occupancy. Disclosure: I won the flights to Croatia with Air Transat and Transat provided a media rate for our Discover Croatia multi-destination tour. All other expenses were my own as are the opinions in this post. Thank you for a great informative post with so much information and detail of the experience.